A land of rich cultural diversity, the Indian sub-continent, prides itself of many colourful festivals. A majority of them are religious and often celebrated as tributes to Gods and deities. 'Ganesh Chaturthi' commemorates the birth of 'Lord Ganesha' and is one of the grandest and most elaborate of them, especially in the western India state of Maharashtra. Also known as 'Vinayak Chaturthi' or 'Vinayaka Chavithi', it is observed during the Hindu month of 'Bhadra' starting on the 'shukla chaturthi', i.e., fourth day of the waxing moon period. (The date usually falls between 20 August and 15 September). The festival lasts for 10 days, ending on Anant Chaturdashi (fourteenth day of the waxing moon period). The inception of this festival is not clear; however, according to historian Shri Rajwade, the earliest Ganesh Chaturthi celebrations can be traced back to the reign of Satavahan, Rashtrakuta and Chalukya dynasties. 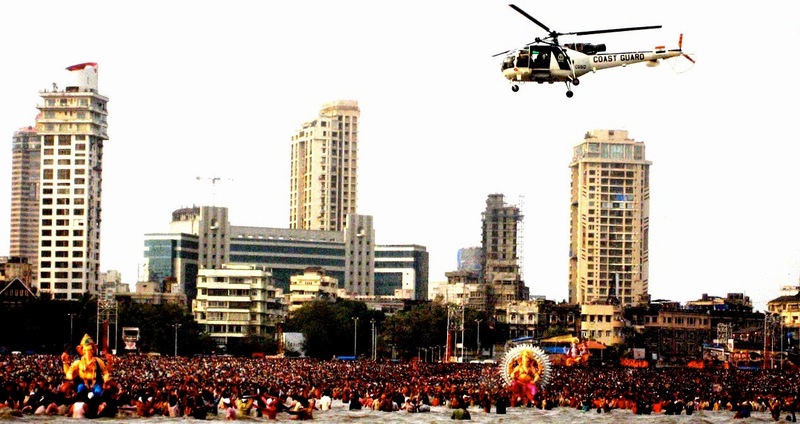 Historical records also reveal that Ganesh Chaturthi celebrations were initiated and widely popularised in Maharashtra by Chatrapati Shivaji Maharaja, the Maratha ruler, to promote culture and nationalism. Eversince Ganesh Chaturthi has become a festival of importance and grand celebration in the state of Maharastra. Indian freedom fighter and social reformer Lokmanya Bal Gangadhar Tilak also contributed significantly to the widespread acceptance of Ganesh Chaturthi. 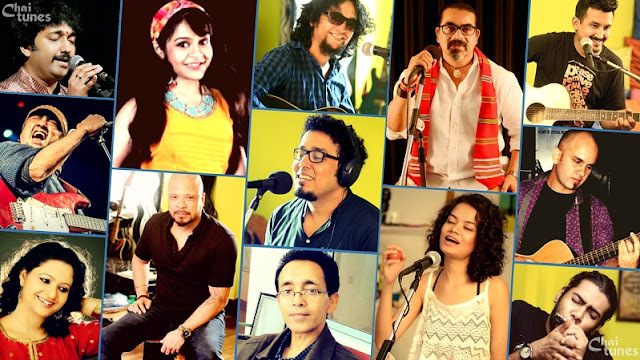 Under Tilak's encouragement, the annual domestic festival took the shape of a large, well-organized public event. Ganesh Chaturthi facilitated community participation and involvement in the form of intellectual discourses, poetry recitals, performances of plays, musical concerts, and folk dances. It also served as a meeting ground for people of all castes and communities in times when, in order to exercise control over the population, the British discouraged social and political gatherings. In Hindu mythology, Lord Ganesha is the first son of Lord Shiva and the Divine Mother Parvati. Ganesha has many other titles and epithets, including Ganapati and Vigneshvara. 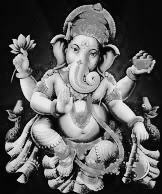 The name Ganesha is a Sanskrit compound, joining the Sanskrit words - gana, meaning a group, multitude, or categorical system and isha, meaning lord or master. The Amarakosha, an early Sanskrit lexicon, lists eight synonyms of Ganesha : Vinayaka, Vighnarāja (equivalent to Vignesha), Dvaimātura (one who has two mothers), Gaṇādhipa (equivalent to Ganapati and Ganesha), Ekadanta (one who has one tusk), Heramba, Lambodara (one who has a pot belly, or, literally, one who has a hanging belly), and Gajanana (having the face of an elephant). Lord Ganesha, a symbol of wisdom, knowledge and prosperity is represented with an elephant’s head. The portrayal of Lord Ganesha as the blend of human and animal parts illustrates some philosophical concepts of profound spiritual significance. The large elephant head symbolizes wisdom and understanding; the wide mouth represents the natural human desire to enjoy life. The large ears signify that a perfect person is the one who possesses a great capacity to listen to others and assimilate ideas. The trunk denotes the strength to face the ups and downs of the external world and yet delicate enough to explore the subtle realms of the inner world. The elephant eyes are said to possess natural deceptiveness that allows them to perceive objects to be bigger than what they really are. The four arms indicate that the Lord is omnipresent and omnipotent. The left side of the body symbolizes emotion and the right side symbolizes reason. The right foot dangling over the left foot illustrates that in order to live a successful life one should utilize knowledge and reason to overcome emotions. A human body with a big belly signifies that the human body possesses a human heart, a symbol of kindness and compassion toward all. The big belly signifies that a perfect individual must have a large capacity to face all pleasant and unpleasant experiences of the world. A mouse sitting near the feet of Ganesha and gazing at the tray of Laddus: a mouse symbolizes the ego that can nibble all that is good and noble in a person .The mouse is also the vehicle of Ganesha, signifying that one must control ego in order for wisdom to shine forth. A tray of 'Laddus' (a popular Indian sweet or snack) near the Lord denotes that He bestows wealth and prosperity upon His devotees. 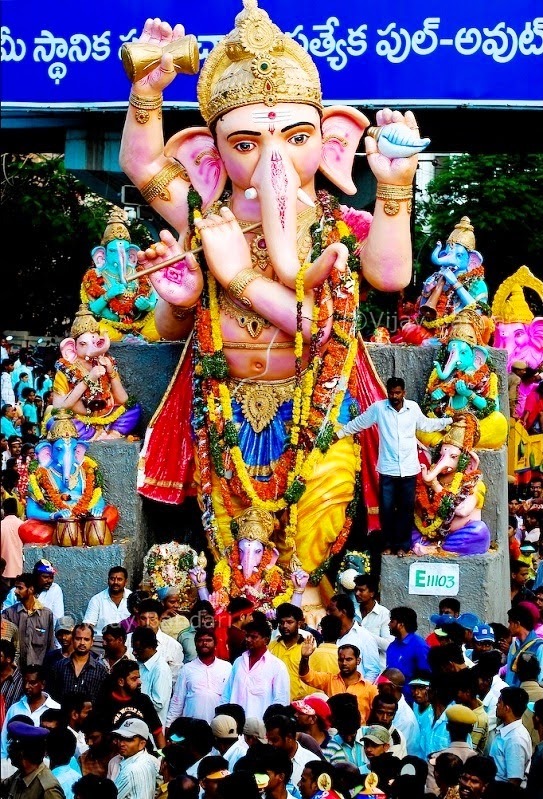 Ganesh Chaturthi is widely celebrated in India, especially in the western and southern parts. Outside India, celebrations are also seen in some parts of United States, Canada and Fiji.